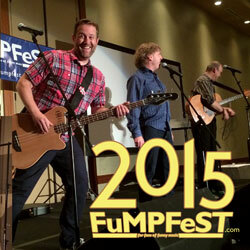 The second FuMP convention, FuMPFest 2015, was an amazing weekend of funny music featuring The Arrogant Worms as our guest of honor, performances by Tim Cavanagh, Steve Goodie, Carla Ulbrich, the great Luke Ski, and many more, plus events like Dumb Parody Ideas and the 5th annual Logan Awards ceremony. And we recorded it all! This 2-CD set highlights some of the best moments and best performances from the convention so you can relive the fun, or experience it for the first time if you weren't lucky enough to be there in person. It features 55 tracks and over two hours of comedy from this amazing weekend. Every artist who performed at FuMPFest 2015 gave us permission to include these recordings on this compilation so that we can raise some money to help produce FuMPFest 2016, and we are extremely grateful for their generosity. So help us out by picking up your copy. Get your copy now! Purchase the CD and get the digital download for free, or just get the digital download if you already have enough crap taking up space in your house.